Even for Bangladesh’s case CIGARETTE butts, poly bags don’t fall from sky, they fall from our hands. The elements that pollute our beaches are the things that we dump in the shorelines; these elements are the things we use regularly and for that it not necessary to be a developed one. Bangladesh has the longest unbroken sandy beach in its south- eastern part spanning 92 km of wide area where most of the deltaic rivers feed to the Bay of Bengal. So fishing was and still is common in the entire are. But from time to time unplanned tourism causes a permanent damage by construction of buildings, shops, households and permanent structures. To meet the daily necessity over fishing around the shore area made our fishermen quit fishing due to scarcity of fishes. The second option they took for their living is small business of goods that tourist are interested in. Due to lack of proper legislative action, dumping and collecting of debris has become a problem but in a country like Bangladesh, where a very large number of people are still living under poverty line, environmental issues are yet to be prioritized. And when it comes to its sea, it is merely understandable by the mass what oceans are giving us and how we are polluting them in return. May be that’s why this problem has still not been underlined. The overall statistics of the pollution in that territory (Cox’s Bazar of Chittagong district) and its content elements are devastating. 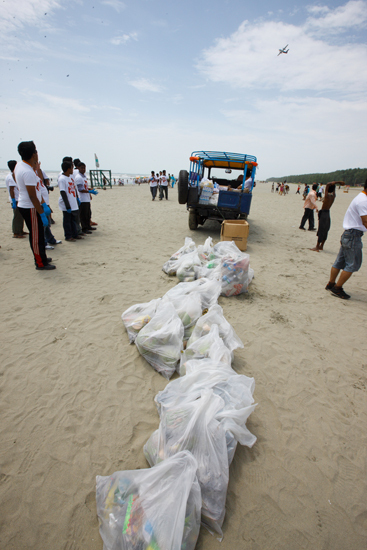 In addition to providing the Marine Debris Index –place to place around major tourist hotspots data about 300 kilograms of trash picked up from very specific area indicates singular source which is tourist activity — this statistics reveals the sources of debris: from cigarette butts and fast-food wrappers. It also identifies the connection between the stress caused by marine debris and the ability of the ocean and its critical life support systems to adapt to the onset of global climate change. 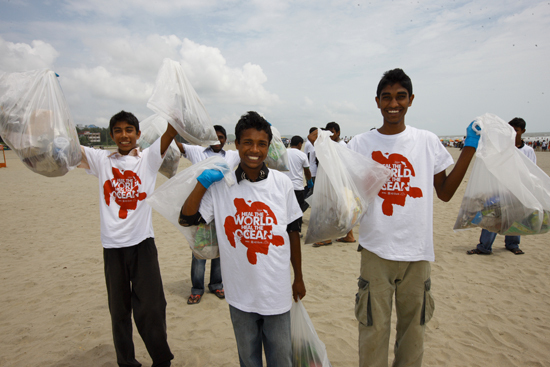 After implementing a day long advocacy program named International Coastal Cleanup this scenario is changing. Local government with help of corporate sponsorship a “beach committee” is formed to collect this easily visible debris from the shore. Targeting floating tourists, day basis work labors are working round the year. This activity has reduced the number of total collected debris from the shore as well as it reflects a positive impact towards tourist behavior of thronging litters here and there. However inadequate number of receptacles and proper knowledge on storing is still missing. Due to that new problem is occurring and that is micro debris. What we can see now on our shore can easily be removed but litters like polythene bags, fishing nets, cigarettes butts and other non degradable items which are stored under the sands of shore are yet to be explored. After time, these things are coming towards the upper parts of the sand layers and getting destroyed by wind, storm, sun and the heat of summer. Now it is easily visible near around unplanned settlements like shops and food courts. During dry season when wind blows and removes the upper layer of the sand, it exposes elements broken into very small parts and which can easily be distinguished. Current policy is very helpful to maintain the beauty and shore based eco-system but for making to more sustainable, a peoples-government partnership should be developed. Creating new job fields for local inhabitants like recycling, reusing of leftover toxic or non biodegradable materials will certainly ensure a positive feedback for the overall environment. Not only that this will also help reducing the tendency of collecting marine aquatic lives, sea shells, live or dead corals. Emerging tourism creates another problem of overflowing sewage systems and storm drains add to the burden by ferrying trash from rural roads and city streets to the sea. For making our coastal area more sustainable this is the high time to take proper effective actions to mitigate this emerging problem. May be its not popping in front of our eyes as these problem is not visible but for long term sustainability, action should be taken now. 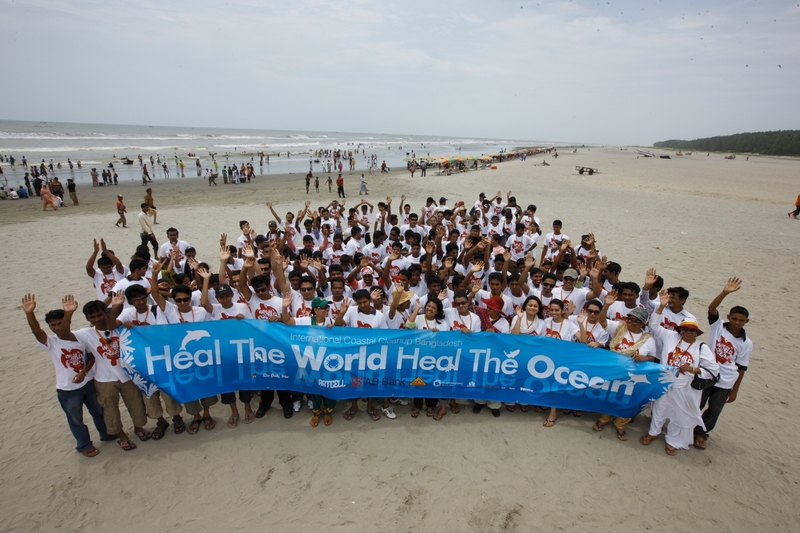 Muntasir Mamun Imran, activist and country coordinator International Coastal Cleanup Bangladesh. kewkradong is an activity place for youth. Adventure is the key here. This is totally non-political, non-violence; non-profitable organization originated in Bangladesh. 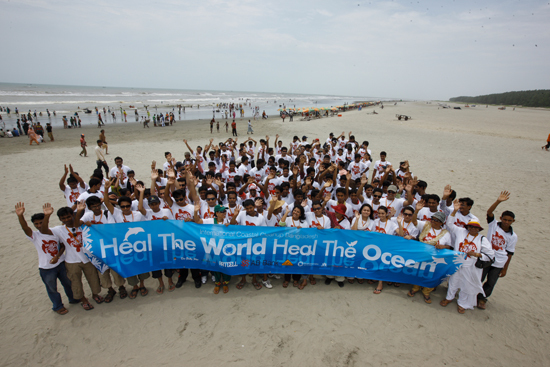 kewkradong community used to run programs all the year round in Bangladesh. kewkradong believes in creating and gathering local enthusiasm towards voluntarism. Extraordinary. I think such informative and motivating articles must be circulated even more. And, preferably in Bangla. May be some organization should also take an initiative to hold dialogues with common people to disseminate knowledge and instigate greater sensitivity. This is one good news from Bangladesh. Always the media shows political bickering. But this is precisely the kind of contructive and hope-generating news that should be publicized to boost the morals of countrymen. Shabash, keep it up. Next time someone also clean up the rivers and lakes/ ponds. We say cleanliness is half of faith but the whole country is so shamefully dirty. Is it because our faith is very tiny? cleaning up the beaches seems a long-pending and most-needed exercise. it was a laudable one indeed! i wish i were there with the youths assembled on the beaches. my salute! no doubt its an interesting web portal.